There are too many photographs of people in the calendar to include identifications of everyone there. Thus, we have created files of identifications  and placed them on the AAVSO website for your reference (perhaps to download, print, and keep near the calendar). ► AAVSO historical tidbits - lots and lots of them! What is the remarkable coincidence about all of the AAVSO Recorders and Directors? Exactly when did the AAVSO leave Harvard College Observatory and where did it go? When did HCO approve of the AAVSO's use of blueprint finding charts? Just what is the "projected star logo"? When did Leslie Peltier make his first observation (and what star did he observe)? Danie Overbeek? John Bortle? Who made the 10 millionth AAVSO observation and when? The who's, what's, where's, and when's of much AAVSO history is given on these pages. The front cover shown above highlights the formal AAVSO organization meeting held in 1917. 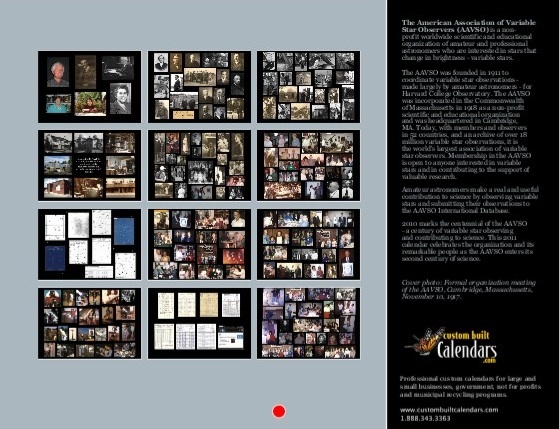 Below are two additional samples from the calendar - the date page for October 2011 and the back cover. 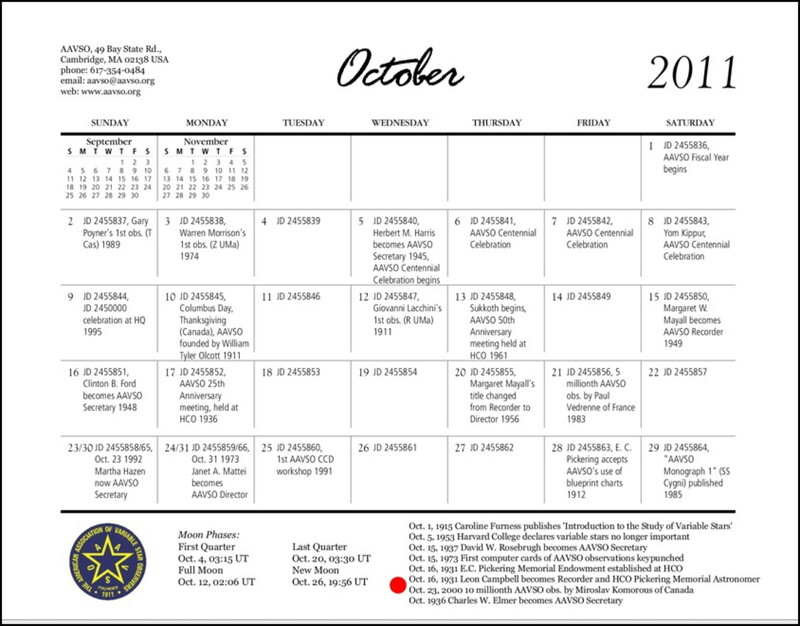 The date page shows how each month's information is arranged and gives you an idea of the AAVSO history covered - October has always been a busy month for the AAVSO! The back cover shows small versions of the artwork for January-December 2011. As you can see, there are many people and many telescopes! 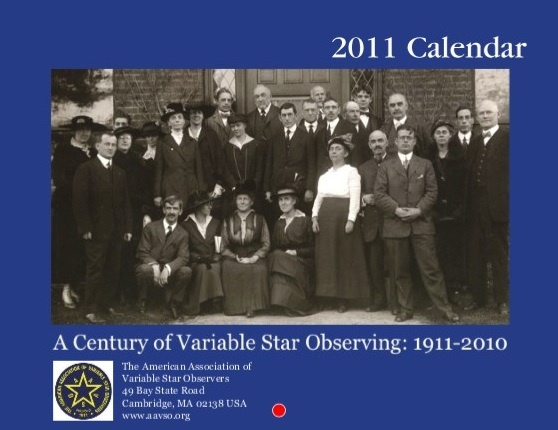 The AAVSO Centennial calendar is 8.5x11 inches in size and covers January-December 2011 and January 2012. The cost (US funds) per copy, including First Class postage and handling, is: $15.00 US address; $16.00 Canadian address; $17.50 all other addresses. Please order through the AAVSO Online Store (http://www.aavso.org/aavso-online-store ). If you have questions about the calendar, please contact us . JOIN THE CELEBRATION AND ORDER YOUR CALENDAR TODAY - TRAVEL THROUGH THE AAVSO'S PAST AS YOU MOVE AHEAD WITH IT INTO ITS SECOND CENTURY!